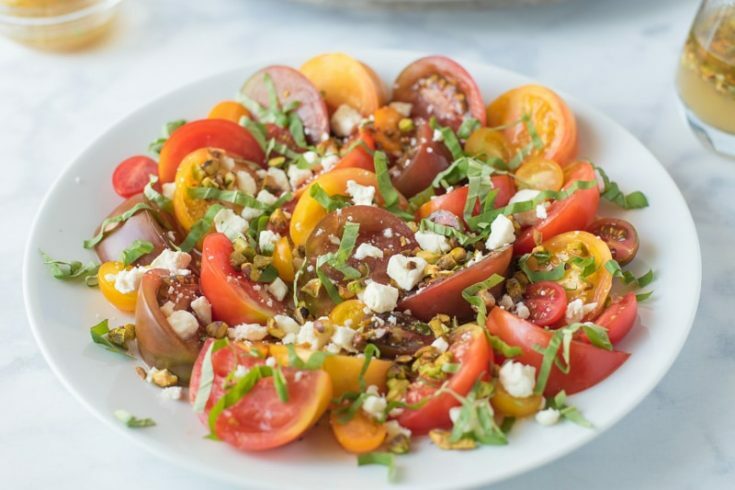 Heirloom tomato salad with feta and pistachios is the ultimate summer tomato salad. Sweet heirloom wedges are plated with feta and fresh basil then drizzled with a light, lemon and pistachio dressing. Heirloom tomatoes are one of my favorite produce items of the season and it is rare for me to not pick up some this gorgeous bounty when I am at the farmers market or store. I think the more variety of color of heirlooms used the better the presentation. I like to mix it up by using various sizes and mixing in really small heirlooms that come in the plastic tubs. This salad was the perfect side dish for grilled key lime shrimp that I made last week and I’ve made this meal twice since because we just can’t get enough and I know that heirloom season will be over soon. All the flavors of this dish marry so well together. The salty, tangy feta with the freshness of basil along with the slight sweetness from the dressing and to finish with a crunch from the pistachios, it’s a party in your mouth. As well as a perfect side dish, this salad would be also perfect as an appetizer or snack. I know I can eat it just about anytime. 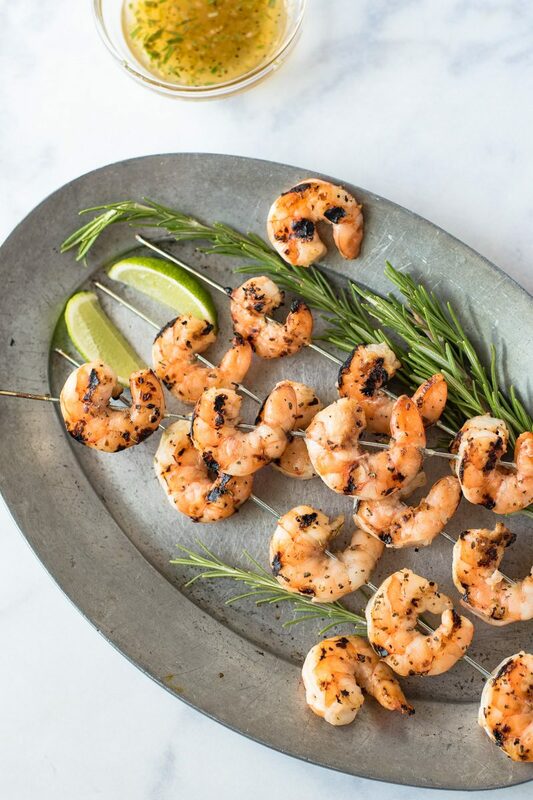 Here is the grilled key lime shrimp I told you about that you must try! Add the lemon juice, basil, honey, , salt, pepper and olive oil to a jar or container with lid. Shake with the lid on and set aside. Add the pistachios to a skillet and heat over medium-low heat. Toast, turning often until fragrant and browned, remove from the pan to a small bowl to cool. Once cooled, chop. Add the pistachios to the lemon dressing. Cut the tomatoes into wedges and arrange on a serving plate and pour over the dressing. Crumble the feta and sprinkle the chopped basil over the tomatoes and serve. What a lovely idea to pair delicious pistachios and feta (2 of my favourite foods!) with beautiful heirloom tomatoes. Heirloom tomatoes are my favorite too. And I can put feta on everything. I cannot wait to try your dressing with pistachios. .
Pistachios! I never would have thought to add them to a salad like this, but it’s brilliant. Absolutely my kinda salad! Thanks for sharing. I’ve been crazy for heirlooms this season, and I got even more at our market yesterday so your timing is perfect! Love the kick of feta and the pretty pistachios! I’m not one to usually enjoy eating raw tomatoes, but even I can’t ignore the charms of these heirloom tomatoes! Will have to try this salad sometime!